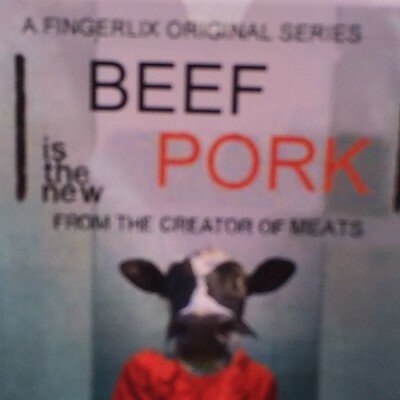 Everybody knows Memphis can do pork. 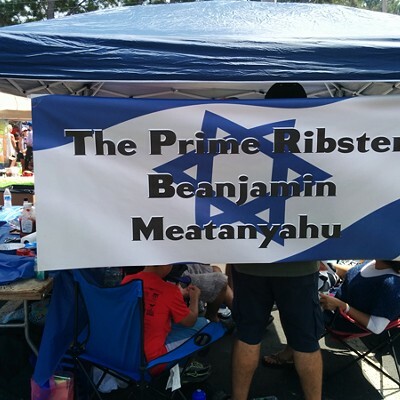 But did you know we also have the world’s largest kosher (beef and chicken) barbecue contest? 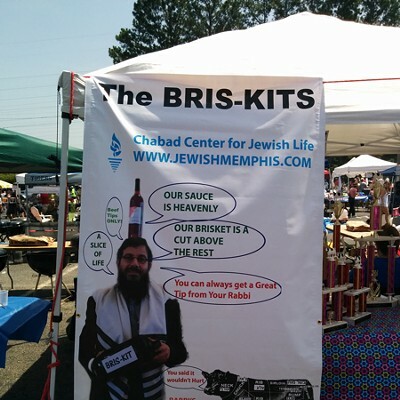 Since 1988, Memphis’s Anshei Sphard-Beth El Emeth Congregation—the oldest Orthodox Jewish congregation in the South—has hosted the World Kosher Barbecue Championships. Each year, over 40 teams compete in six categories, including Best Beef Brisket, Best Beef Ribs, and Best Booth. This year’s contest was on Sunday, August 24th. 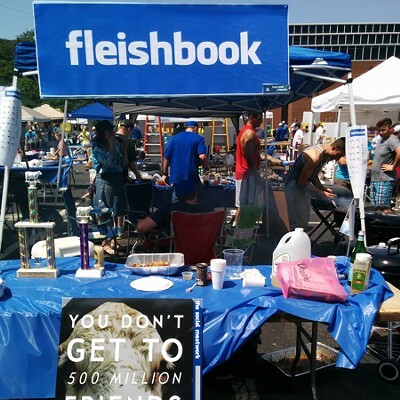 The barbecue was geshmak—that’s Yiddish for “delicious”—and a good time was had by all, Jews and Gentiles alike. 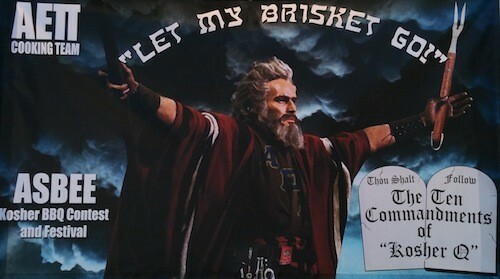 I especially liked the beef ribs at the Temple Israel Brotherhood booth; the meat was a beautiful pink color; perfectly spiced, it fell right off the bone. 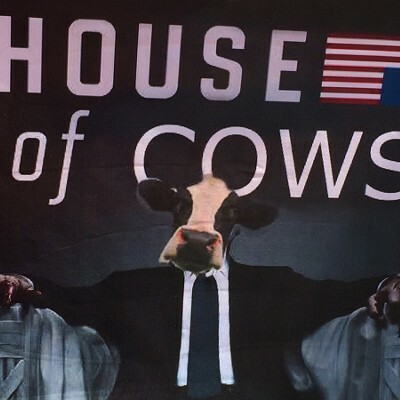 But what really got my attention were the puns in the booth names. 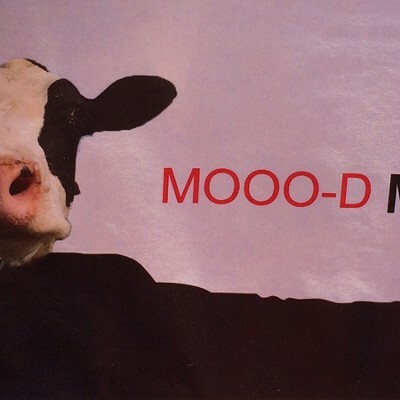 So many puns! 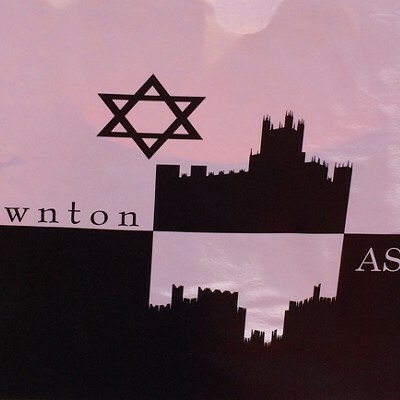 Steaking Bad, Downton ASBEE, Fleishbook. You get the idea. So here, for your delectation, is a photo slideshow of some of the best puns from this year’s competition. How’s your Yiddish? And which is your favorite? Let us know in the comments section below. When it comes to cocktails, it’s getting hard to shock people. I mean, come on. We’re putting bacon in our eggnog and butternut squash in our bloody marys. But once in a while, a cocktail comes along that makes you tilt your head and say, “huh?” Case in point: the Grove Grill’s Pickled Green Tomato Martini. 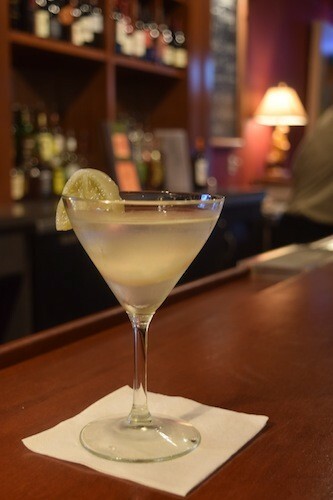 To be fair, martinis have long included pickles—pickled olives, to be precise. But hey, did you even know that pickled green tomatoes were a thing? I didn’t. So I drove on over to the Grove Grill and got general manager Ed Parramore to shake me up a drink. The ingredients are Brandon’s Gin—from Little Rock, who’d a thunk?—pickle juice, and a couple of tomato slices, personally pickled by Grove Grill owner and chef Jeff Dunham. Guys, it’s a hit. The first sip is a bit of a surprise: the vinegar from the pickle juice jumps up and slaps you in the mouth. But the second sip is delicious, and every sip thereafter. This cocktail is all about the marriage of sweet and savory: the sweet botanicals in the gin plus the tart tang of the pickled tomato. Be forewarned: this is not a sugary beverage. It’s more like a dirty martini than a cosmo. But if you like your martini to bite back—and I do—this is a drink for your bucket list. The Veggie sandwich ($8) at Bluefin is not your ordinary veggie sandwich. With its squares and circles and glop of green, it looks like something that might be served in a Tim Burton movie. 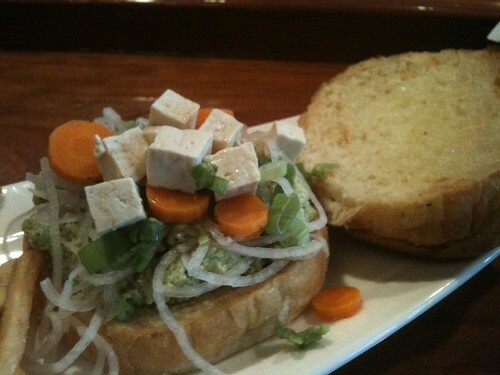 It's edamame hummus, marinated tofu, ponzu cherry tomatoes, cucumber, carrot, and daikon radish served on a buttered bun. 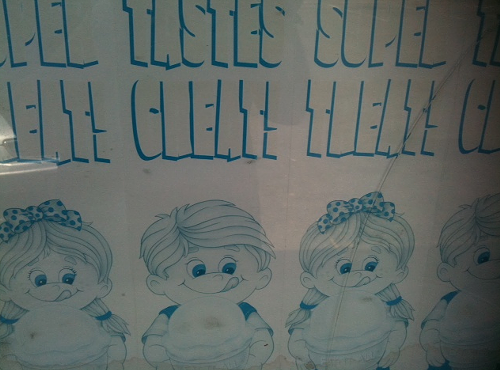 I'm not convinced about everything on this sandwich, particularly the soft buttered bun, which went soggy. But I liked the radish flourish and the tofu was good. The edamame hummus was particularly an eye-opener — earthy and fresh. I would eat this all by itself. The first person to guess where I'm eating wins his or her choice of a gift certificate for Folk's Folly or a gift certificate for Corky's. 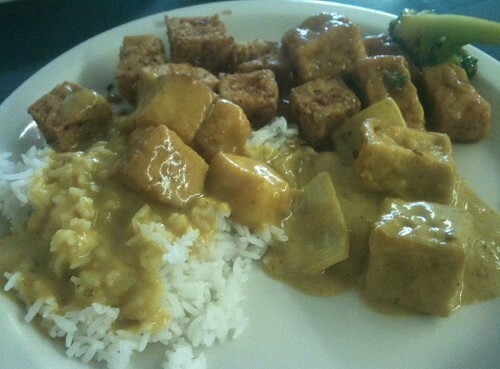 The answer to GWIE contest 35 is the buffet at Pho Binh, and the winner is Brad Parrish! 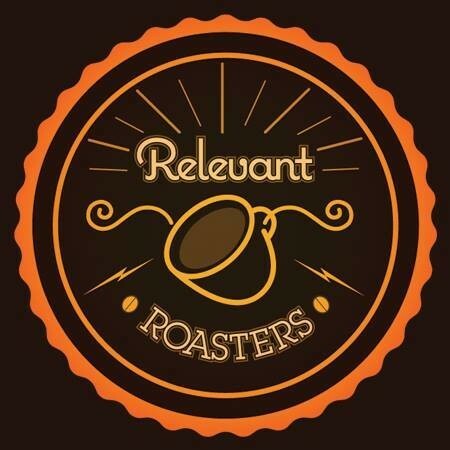 Jimmy Lewis, founder of Squash Blossom, is opening Relevant Roasters, a wholesale coffee-roasting company, in the Broad Avenue Arts District. Housed in a 2,480-square-foot space at 584 Tillman Ave. Suite 1, at the corner of Broad and Tillman, the warehouse will feature convection-roasted, environmentally sustainable whole bean and ground coffee. Following renovations, Lewis intends to be operating by the end of August with first batches ready in mid-to-late September. He plans to sell to local coffee houses and targeted specialty grocers. 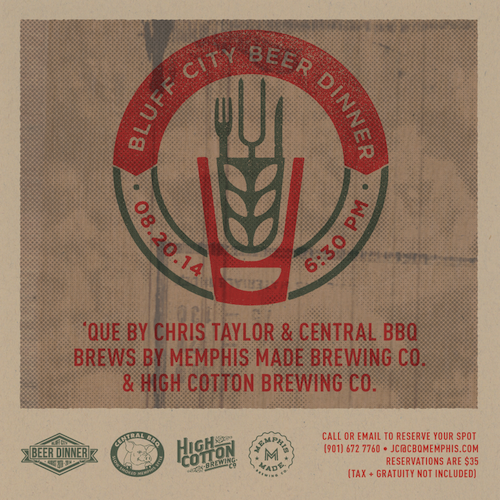 Downtown Central BBQ will be the site of the Bluff City Beer Dinner, Wednesday, August 20th, 6:30 p.m. The "non-stuffy" four-course dinner will feature a whole hog "pig picking" and beers from Memphis Made Brewing Co. and High Cotton Brewing Co. The event will be begin with a few snacks and beers. Guests will receive a commemorative pint glass. The dinner is $35. For reservations, call 672-7760 or email jc@cbqmemphis.com. 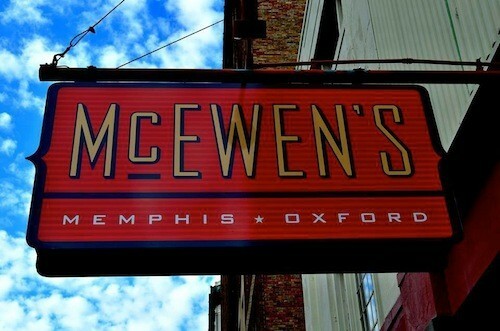 Tags: Bluff City Beer Dinner, Central BBQ, Made in Memphis Brewing Co., High Cotton Brewing Co.
Keith Bambrick, chef at McEwen's on Monroe, will be cooking a Memphis-style dinner at the James Beard House in New York on August 20th. Memphians can get in on the action at this Sunday's preview dinner at 6:30 p.m. The dinner is $125. For reservations, call 527-7085. 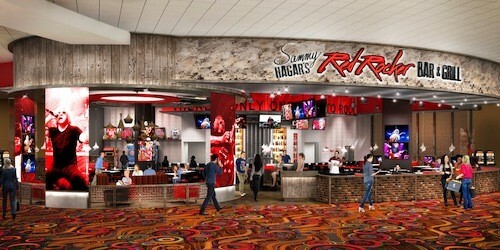 According to Southland Gaming and Racing president and general manager Troy Keeping, Sammy Hagar's Red Rocker Bar & Grill is just one element of $30-million-plus in improvements. There will also be work done on the exterior of the building, valet parking will be added, and the gaming space will be expanded. Results from a survey led to the Red Rocker. "We let our guests tell us what they want," he says, and what they wanted was a sports bar. Uverse needs to get its sh*t together straight away ... unless they know something we don't know??? 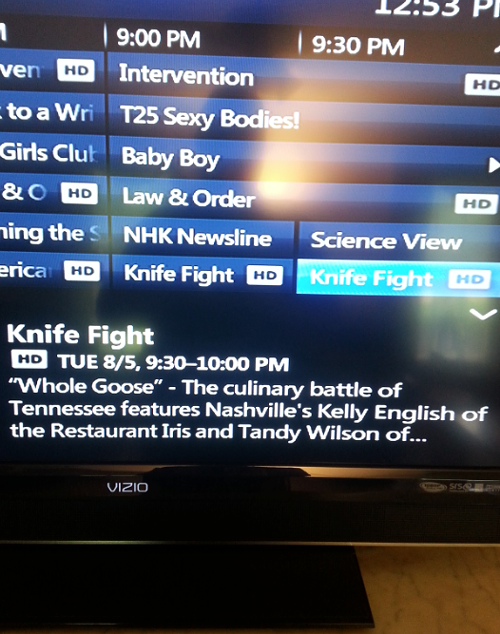 Anyway, Kelly English is going to be on Esquire TV's Knife Fight tomorrow. This place is a favorite of hipsters. It's a favorite of mine too. The first person to correctly ID what I'm eating and where I'm eating wins his or her choice of a gift certificate for Folk's Folly or a gift certificate to Corky's. The answer to GWIE contest 34 is hushpuppies at Soul Fish, and the winner is ... Kim Gullett! Food pics are a dime a dozen, and at this point we’re pretty jaded. What’s that, you say? A photo of a life-changing yellow pukka curry from celebrity chef Jamie Oliver? Yawn. Yet another garden-fresh watermelon salad from Real Simple editor Sarah Copeland? Wake me when it’s over. But once in a while, a food pic comes along that really gets our attention. That’s what happened on Wednesday night, when Interim Restaurant and Bar posted this photo on their Facebook feed. 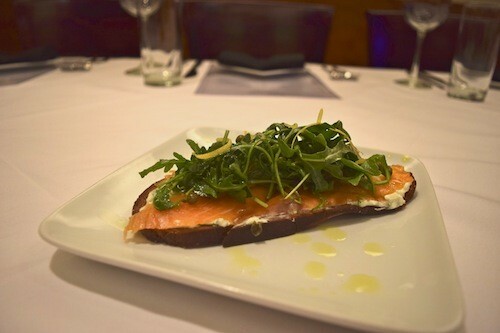 It shows a forthcoming menu item, the house-cured gravlax on German rye bread ($12). I mean, come on, right? I had to try it. Gravlax is a Scandinavian dish that consists of salmon that has been dry-cured with a mixture of salt, sugar, and fresh herbs. At Interim, they serve it over arugula, with crème fraiche and capers. It’s a thrilling flavor combination, and the salmon is so good that they could have served it by itself, alone on a plate. If you order the gravlax, be sure to nibble on a bit of the fish without the fixins. Yum. 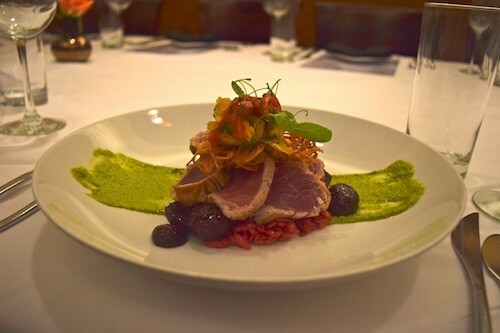 But what really stood out was the seafood special: seared ahi tuna with peach and arugula slaw on a bed of beet orzo (market price, usually about $30). 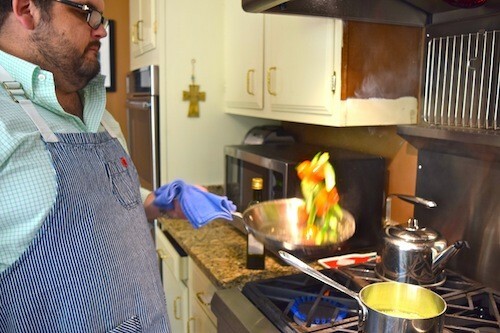 Chef Jason Dallas, formerly of Chez Philippe, developed it together with sous chefs Sepand Mazahery and Ysaac Ramirez. The orzo is rich and hearty, picking up earthy undertones from the beets. The slaw is sweet and a little spicy. And in between, the fish is just terrific. It’s wild-caught, sushi-grade tuna from the Gulf of Mexico, and it tastes like it just came out of the water. And as a matter of fact, did just come out of the water. Chef Dallas handed me the tracking tags from Gulf Wild, a Florida company that works with Gulf fishermen to ensure sustainability, accountability, and freshness. By using a tracking number, I was able to determine that the tuna I was eating had been caught earlier in the week by fisherman Robert Carter, aboard his vessel the Blackjack 1. 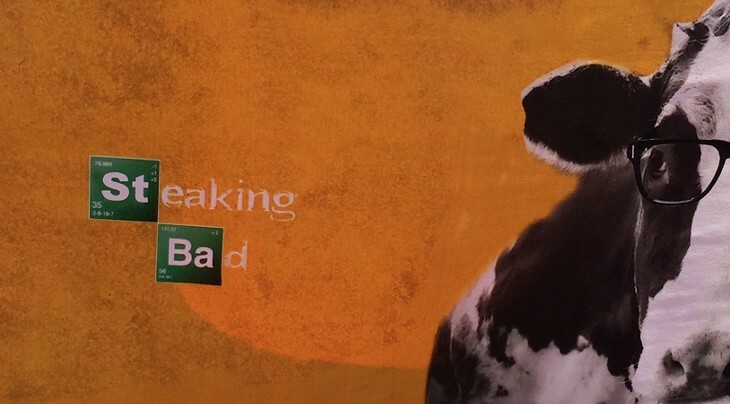 Now that’s pretty cool. If you’re looking for a good example of what Memphis chefs are capable of, you could do worse than to start here. 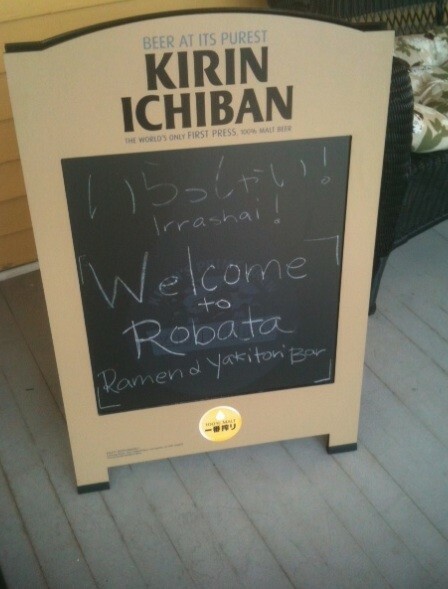 We knew Robata Ramen & Yakitori Bar would be packed the Friday after it opened, but the promise of ramen was too great. We got there right before 5 p.m. to see about half a dozen folks had the same idea. 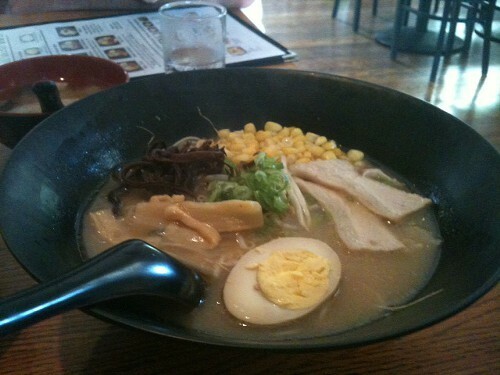 Ordering the ramen ($9.95) is a multi-step process starting with the noodles (thin, regular, fat, or gluten-free rice noodles) and then on to the type of ramen (Tonkotsu, Miso Corn, Soy Tonkostu, etc.) The third optional step is to add extra toppings like barbecue pork, kimchi, or tofu. The broths are either pork of chicken-based, and they offer a vegetarian version as well, though they were still perfecting it when we were there. Seeing as we were a table of mostly vegetarians and vegans, we filled up with yakitori and appetizers.